While it is sad to see the sweetness of summer days, so long anticipated during the school year, draw to a close, there is a sweet anticipation to the start of the school year, a time of fresh beginnings. Few events are more central to a successful fall kick-off than helping students feel at home in their new classroom. Teachers spend many hours planning games and activities to help their students to become acquainted with them, classroom routines and peers. One vehicle for achieving this is the careful selection of read aloud books. 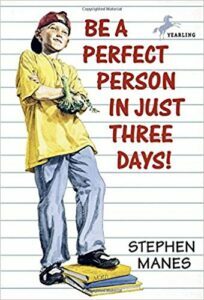 One tried and true book that was introduced to me by a now retired colleague years ago is Be a Perfect Person in Just Three Days! by Stephen Manes. The moral of the story, as you have probably guessed, is that no one is perfect and the world would be a pretty boring place if they were. This hilariously funny book drives the point home in a zany, offbeat style all its own. Filled with puns, it is ripe for teaching this literary device – an added bonus. It is the first book I read each year, always a hit with students. Don’t miss this student-tested, teacher-approved reading comprehension packet to leverage this wonderful book. Give this a try – after reading the first instructions for the first day on Dr. K Pinkerton Silverfish’s 3-day perfection plan, bring a head of broccoli and string to school. Offer students the chance to wear a stalk of broccoli around their necks for the day, just as Milo must do in the book. Wear one yourself and your students will see what a good sport their new teacher is! Together you will have fun responding to the questions and odd looks you will get as you travel throughout the school during the day, a great way to build class camaraderie! 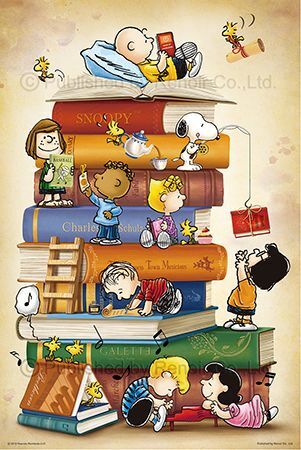 Looking for more Back To School resources, including more suggestions for read alouds? I have gathered a ton for all ages on my First Days of School Pinterest board. Follow this and all of my boards where I gather the best ideas for teaching and learning. Visit Lessons From the Classroom to find engaging activities and lessons. Many free, all highly rated by busy teachers committed to making the most of every moment of learning for their students. 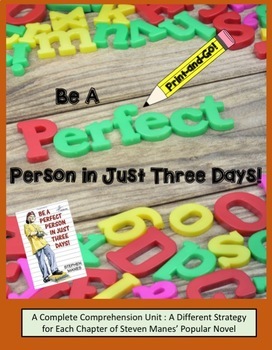 Lesson from the Classroom: Be A Perfect Person in Just Three Days.